Guus Hiddink has decided to stay on as manager of Anzhi Makhachkala. It was reported earlier that Hiddink might leave the club, but the Dutch coach has instead extended his contract with the club for another year. Guus Hiddink was ready to retire from management after the season with Anzhi saw the team finish third in the Premier League. However, the Dutchman has decided to give one more shot at winning the Russian league title with Anzhi. The Dutchman’s original agreement with the club included a +1 option — i.e., the possibility of extending it by a year. On June 11, Anzhi’s chairman, Konstantin Remchukov, posted on Twitter that this option had been taken. The former chief coach of the Russian national team and manager of Chelsea took over at the Makhachkala club in February 2012. The management of the Dagestan team saw Hiddink as a man who could take a collection of stars (Samuel Eto’o or Roberto Carlos, for example) and make them into a viable team capable of bidding for the league title. Anzhi was to win the title in the 2012-2013 season — but plans sometimes change. In the winter, the team lost central defender Christopher Samba. This proved to be a key loss: Without the strong Congolese player, the Makhachkala defense did not look so convincing. After starting the season with eight straight wins, the Makhachkala men seemed to lose all their former strength. The players became nervous, and the team’s captain, Samuel Eto’o, started having tantrums on the field. Then Anzhi went on to suffer five defeats at the hands of teams that, by any account, they should have beaten. Their defeat at the hands of Krasnodar was especially painful: They lost 4:0. As a result, they finished third instead of first, the latter of which had seemed a real possibility. This result proved to be unsatisfactory, even though it was Anzhi’s best finish in the entire history of the club. The team still had a chance of securing an upbeat finish to the season, as long as they could beat CSKA in the final of the Russian Cup. Anzhi came very close to doing so, but the army team came out on top in the penalty shootout, and the cherished trophy slipped through Hiddink & Co.’s fingers. Guus had been thinking about ending his coaching career even before the Russian Cup final, but the discussions were very vague and non-specific. Hiddink himself refused to make any intelligible comments regarding his future. “As far as my future with Anzhi is concerned, everything will be sorted out in the next few days, and then we’ll let you know,” said the manager, after losing to CSKA in the Russian Cup final. Yet no information emerged in the following couple of days. 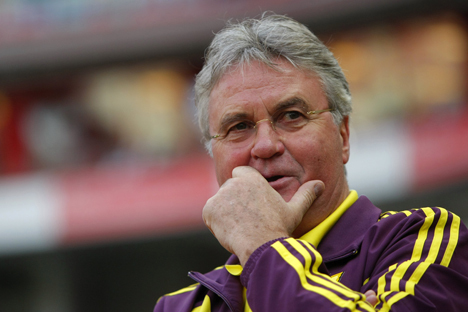 Only after almost two weeks was the final decision announced that Hiddink was to stay with Makhachkala. Whether he serves out his contract to the end will depend on him alone. It is clear that, next season, the club’s president, Suleiman Kerimov, will set the highest objectives for Anzhi. If all fails, the club will be able to find a replacement for him: It has been reported that, if Hiddink leaves Anzhi, Samuel Eto’o will become the team’s player-manager.